Former Bucs QB Chris Simms is a very smart and fun guy. Joe enjoyed chatting with Simms at the NFL Owners Meetings in Phoenix last week about how far too many NFL media types are out of touch with fans and have forgotten that it’s all supposed to be fun. Simms gets it, and his new gig with NBC Sports is perfectly to suited to his analyst style. Anyway, Simms was talking this week about the Bucs, which remain very close to his heart. Simms has long been a fan of America’s Quarterback, Jameis Winston. He and his analyst dad, Super Bowl-winning QB Phil Simms, were very pro-Jameis back in 2015 and early in Jameis’ career. Now, however, Simms is at the end of the line with Jameis but remains optimistic. “You’ve got a quarterback that’s certainly been a knucklehead but has upside that I think we’ve all seen and gone, ‘Wow, there’s moments that we see that are special with this kid,'” Simms said. 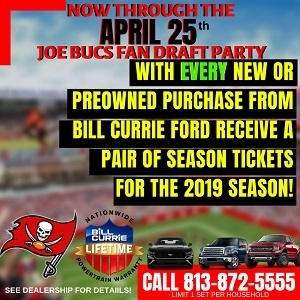 Simms was adamant that the Bucs are at least a six-win team for 2019, and said he definitely would wager on that Bucs over-under-six-wins total put out recently by the Vegas wiseguys. He thinks Tampa Bay is one of the best bets on the board, though Simms didn’t call the Bucs headed toward a winning season. The conversation came up on Chris Simms Unbuttoned. Yes…..Peyton Barber is better than most realize……and yes the oline is “not bad”….but it’s not good either. And yes…..definitely Jameis is a knucklehead (how long has it been since we’ve heard that term)…..and yes he does have an upside……but unfortunately, he has a downside also. So…Simms is very much correct in his analysis. But….is playing it safe. Couldn’t agree more. Along with many others on this site. Yet the word “hater” comes out if you make the same points. I don’t get it. He has been a knucklehead and his upside is tremendous. Arians is the perfect hire to bring out his best football. 1st half of 2018 Winston was the Nuke Laloosh of NFL QB’s. 2nd half of 2018 Winston was the Crash Davis of NFL QB’s. Anybody with half a brain can see Winston has improved. Unless you are biased and choose not to. I expect to see a greater improvement in 2019 under a better coach. Florio is the man. Simms is yes, fun at times, entertaining on PFT Live and NBC Sports. Simms…is not an analyst, whatsoever. Just opinions. Not an analyst. Neither is Phil. Thus, nothing here. Gotta go get real NFL personnel analysts, then cool, we’ll consider the feedback. I think the offense is good enough to win 6 games, defense/ST will win us 2 and good ole coaching will win a game. That’s 9 wins and you always take one victory away since we’re the Buccaneers and you have 8-8. I agree with his statements as well. I have defended Jameis from all the “haters” and they are haters because they use unjustifiable statements to make their points and take immature pot shots at Jameis at any opportunity. While I am a staunch supporter of Jameis, I wouldn’t be able to pay Jameis 30M/yr if I were a GM. I do think Jameis has more to prove and for many different circumstances, he hasn’t always had the right situation to succeed. 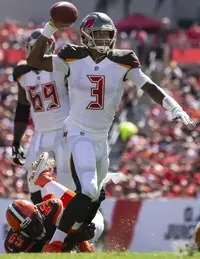 So I hope (along with any Bucs fan who wants to succeed) that Jameis has his best year yet and is consistently playing at a high level this season. I just want to win and our best chance to start winning next year and in the future is to have that young man put it all together and play like a top 10 QB that he can be. Simms might have made it but for the spleen injury. He’s right about JW, this is his last chance. I would only modify his statement to include that he was coached by knuckleheads too. Just to be fair. He’s going to have a big year and get a big contract. profootball talk is the TMZ of the NFL. They report on what Aaron Rodgers had for breakfast basically. It is a great source of news but it perpetuates the male version of the Kardashians with all the NFL drama and speculation. Yup. Dewey nailed that one. Let’s hooe for some freaky sht to happen for two other wins. Maybe a blown call or two. It happens to us every year, so we’re due. Simms our to know he gave his heart and spleen err soul to the game! Chris is right. He is not just a knucklehead but is also an arrogant ignorant womanizing homophobic narcissistic human turnover machine. Oops in moderation guess Joe is back censoring comments. Sounds phony, I don’t believe for a second he said “crap” instead of sh!t. I have said this time and time again what does this quote “If he can’t make it happen as far as Bruce Arians with Jameis Winston right here; and Bruce has made every quarterback better, then yes, Jameis is in deep crap” mean. Does “make it happen” mean, no turnovers, does it mean winning, does it mean having a higher comp%, does it mean having a higher QB rating? What exactly is this “next step” or “getting it” that we are looking for? This is my problem, can he get better, of course, but when will we act like normal people, you know those with brains, and start judging him by what he is asked to do and not expect him to win games alone? How about we actually improve the TEAM then judge the QB, cause when teams know you are going to throw, they know you have to score 35 points a game to win and they know you can’t make FGs it might have something to do with the QB not playing the perfect football this fan base expects. Again Jameis’s numbers stack up very well in every regard with many of the greats in the game in their first four years and they were praised while he needs to “finally get it”. Give me a break this whole narrative is a joke and solely based on the person and people’s dislike of him. So why lie I actually respect the people who just admit it instead of making themselves look silly when their facts are just flat wrong. The same for the national media they just buy what ESPN, Steven A Smith, Max Kellerman is selling them. Does anyone think those guys watch our games and can make an actual judgement? That snowman left his spleen on the field. Why are listening to and writing about Chris Simms opinions? Does anyone remember the SF game we were driving as he loafed and laughed off losing. Chris Simms is the talentless knucklehead! Pumped for Jameis in his 5th year. I expect to see a polished, professional- executing and playing like a former number one pick that is posturing for his second contract. No BS, no suspensions, no 4 INT games (Like @ Cinci) and make good decisions on and off the field. I am rooting for Jameis! He’s got the talent, and we will see if he can put it together this year. I do agree with a lot of posters on this thread, that Buc Fans with an objective eye are labeled “haters”. This team has sucked for years, so the shade thrown is warranted. How can any Buc Fan look in the mirror and say Jameis is a sure thing $200 million contract. Why pay huge dollars to the “fourth best QB in the division” (as Joe so aptly likes to put it). I just want to know what is the criteria for his make it/break it year. Mad respect for Chris Simms. For the record Drew Brees has had 3, 4 plus interception games in his career. Tom Brady has had 5, 4 plus interception games. Ben Roethlisberger has had 3, 4 plus interception games. Dan Marino had 4, 4 plus interception games. Everyone has poor games but when Jameis has them he is trash when the proof shows he is not alone. If you look at each of these 4 plus interception games most of them also had their team giving up a ton of points. Hey doesn’t that sound like something Jameis has dealt with each year of his career? One thing I know is that Elie gets all the excuses in the world. It’s never his fault why his team lose , it’s never Andrew Luck fault why his team lose, it’s never Matt Ryan fault why his team lose, it’s never Stafford fault why his team lose, it never there fault and it’s always Brady the reason why the Patriots win regardless if the defense and running back carried him to a super bowl and all ways him the reason why they win even when the Patriots won without him . But when the bucs lose its always his fault regardless how bad his team is. 31st in run blocking out of 32 teams with no injuries to your starting OL is absolutely “bad”. It’s never Elie fault why his team lose, it’s never Andrew Luck fault why his team lose, it’s never Matt Ryan fault why his team lose, it’s never Wentz fault why his team lose, it’s never Rivers fault why his team lose, it’s never Brees fault why his team lose but for the bucs it’s only Jamies fault on why his team lose. Jamies is in a no win situation cause even if he plays good they still will find a way to blame him for the loss. I’m ready for Jamies to leave this trash franchise and this trash fan base . Let this guy go win some where else cause he’s in trouble with this team. I appreciate a national guy calling someone out instead of just loving everyone. Winston sure looks like he can be very good sometime. I don’t see great. Besides the interceptions, his lost fumbles are very high as well. Brees and Brady with 32 and 34 lost fumbles in their career. Jameis already with 16 in his career. Just more careless of a player than the greatest ones. Pretty simple this year. Either Jameis shows he can be a consistent top QB or you draft a QB next year. It’s make or break. He’s out of excuses so inconsistent sloppy play. He either elevates the team this year or you need to prepare to move on. I’m not a Winston supporter, but he did rank 8th in total QBR last year. If you had a defense ranked 8th and a running game ranked 8th as well you’d probably make the Super Bowl not to mention the playoffs. He’s a fine player, he just falls short as a human being it would seem. Brady had 43 fumbles in his first four years staring meanwhile Jameis had had 38 fumbles in his four years but let’s not let the facts get in the way of your baseless points geno711. Lost fumbles are pure luck, a fumble is a fumble you can’t say one player is more careless than the other when the one you are saying is more careful actually fumbled the ball MORE!!!! But again those pesky facts always hurt the brainwashed arguments don’t they? Dan so your blaming us having the worst defense in football, the worst kicking game in football, a bottom 5 rushing game in football on the QB? But I guess those things had nothing to do with the win loss record right? And BTW THIS TEAM WILL WIN MORE THAN 5 GAMES YOU CAN BOOK THAT SIR! Also BA actually shows he knows more about this team already than Dirk ever did. He knows Hargraves and Davis are man 2 man corners, he knows Spence is a linebacker, he knows McCoy is useless, he knows Barber is a good back, he knows Godwin can and should play in the slot, he knows Stewart is a safety, he knows not to be a passive chicken spit 90% of the time. Do you not remember each time we played Arz when he was coaching them? They out coached us by a mile each time, heck he probably knew our players better then than Dirk did, even back then. Gruden asked for help to simplify his playbook? From Chris Simms? Uhm….Ok…. Its widely known his playbook was way too complex, just ask Ronde about it sometime, he told me the same thing after Grudens last year. Ndog good point to my fumbles point yours is stronger. Never watched much college football so did not have a strong opinion on Winston until I saw him at the Combine. Loved him there but knew it was just a showcase event and not an on field event. I may or may not watch more pro football than you. My eyes tell me he is not going to be a top 5 QB year after year. I hope he has many years that he is but it may be more like a Matt Ryan where he has one superior year. I am not sure what you mean by brainwash argument. If you know me even a little, you would know that I do not follow a crowd in my views. Rank the QB’s in the nfc south from 1-4? Best to worst. Easy Bird: Brees, Ryan, Winston, Newton. And there is no crush it’s called facts and eyeballs. I don’t care for cam so at least I’ll give you benefit of the doubt. I to agree like many others in what Simms had to say. What worries me is that BA will be over seeing his coaches but they in essence are calling the plays. Biggest worry is Leftwich running the offense. But I guess we’ll wait and see. Perfect article, JOE. Loved it. First of all. I am definitely a Chris Simms fan. I enjoyed his time here as our Bucs QB and I really love him on air with Mike Florio. I obviously have been very much on record as a big Jameis fan. I completely 100% agree with the statement by Chris. I completely believe that Jameis can still be very special in this league and a TRUE franchise QB who leads us to a lot of wins. That being said……. THIS IS IT, JW. It must be NOW….. or it is over. I do believe it can be NOW. Definitely disagree with you, Scarz. Honestly, you would be hard-pressed to find ANYONE in the business who has put more film time in, studying QB’s on every level. Chris has put the work in. I always respect your thoughts, Snowman, so this one really surprises me. PFT just might be THE MOST well-informed and well-regarded go to entity in all NFL circles. Mike Florio has put the work in for a LONG LONG time and is relentless in his need to get it right. I had that thought while doing my daily reading on PFT. I was thinking,” dang there hasn’t been a football game in months and there is still enough football drama to keep the soap opera going year round.” TMZ was probably not a great comparison but the point is they report on evvvvverything and keep you interested year round in a 6 month sport. No doubt man, haha! — That amazes me too, the fact that we still have new NFL little stories every single day.